Endodontic treatment or root canal treatment usually involves the removal of the tooth's pulp (nerve). It is the soft tissue that contains the blood vessels, nerves and connective tissue of a tooth. 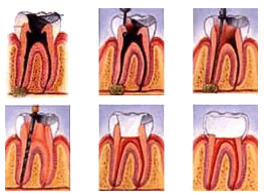 The pulp extends from the internal surface of the tooth to the tip of each root. Some teeth have more than one root and several root canals. If the pulp is diseased or injured and unable to repair itself, it loses its vitality. The most common causes of pulp death are a deep cavity, a crack, or traumatic injury to the tooth, all of which can allow bacteria to leak into the pulp. If the injured or diseased pulp is not removed, the tissue can become infected and an abscess can form, causing pain and swelling. Without treatment, the tooth may have to be removed. The decay is removed and an opening is made through the top of the tooth into the pulp. The pulp is then removed and the canals are cleaned of bacteria. Next, the canals are filled with a biocompatible material and then sealed. The final step is to have a crown made of porcelain or metal and placed over the tooth. The purpose of a crown is to restore a tooths normal size, shape, and to improve strength. As long as the roots of a treated tooth are being nourished by the tissues around it, your tooth can remain healthy. The tooth can still become decayed, so good oral hygiene and regular dental exams are necessary to help prevent both tooth decay and periodontal disease.